The more I hear about Georgia, the more I want to visit. No offense to any Georgians who may be reading this, but it wasn't a place I really longed to visit until fairly recently. Maybe it's all of the wonderful things my husband has learned from his associates in Savannah and Atlanta (Hi! Leave a comment some time. ), a desire to visit our friends Lou and Kym who recently moved there, or all of the gorgeous images I have seen of grand estates in Buckhead through Things that Inspire, Brilliant Asylum, and so many other top-notch design blogs based out of Georgia. It seems like such a regal, elegant, yet laid back place. Hopefully, we'll make it over for a visit some time soon. Have you ever read 'Midnight in the Garden of Good and Evil'? It is an awesome book, set in Savannah. I have read it about a dozen times, and every time it makes me want to go there more! Savannah is beautiful, but if I had to pick one great place in the Southeast to visit, it would be Charleston! It is one of my favorite places. Thanks for the mention! 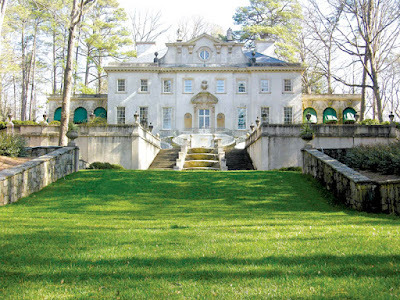 I was just on a walk on Tuxedo Road in Buckhead, and there was a 6 acre lot for sale. There are not many cities where you can live on a 6 acre lot in the best part of the city! Atlanta is a great place for homes and design. TTI- Charleston is definitely on my short list of places to visit! It seems like such a beautiful, charming city and I've heard wonderful things about it. Come visit us....I just did a post about Savannah and Charleston. I live near Atlanta and it just doesn't compare to Savannah. Even though I love to hate my southern-fried state sometimes, I think Georgia has a lot to offer--mountains, beaches, cities, culture and countryside. Savannah is beautiful and haunting and inspiring. Atlanta is huge and diverse with hidden pockets of southern charm. I'm in love with everything about the architecture of this estate. I want to jump into the picture and knock on the door, begging to be let in! Oh, I know, Michele! Isn't it gorgeous? I really want to go! 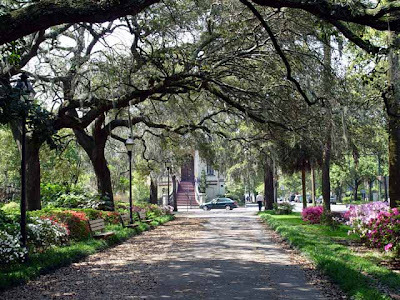 I have to say that Savannah is one of the most beautiful towns that I have visited in the U.S. Perhaps, it is the most beautiful town. It has it all, history, architecture, gorgeous green spaces and Southern charm. My only complaint was that I was there in June, and Savannah definitely gives Houston a run for its money where the humidity is concerned. Despite that, it is worth a trip to Georgia for Savannah alone.